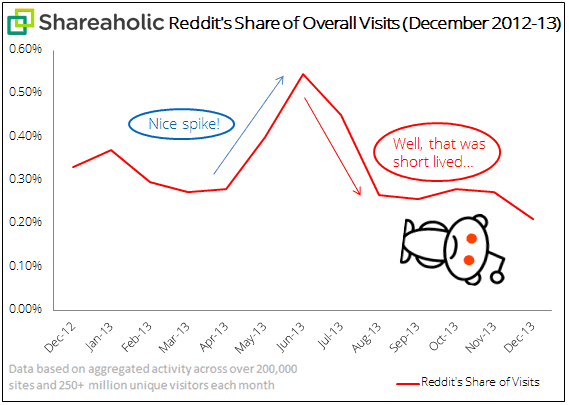 Effectively, in 2013, Reddit saw a 51% increase in pageviews and an 83% increase in uniques year-over-year. That’s HUGE, right? Our data, collected over 13 months (Dec 2012 – Dec 2013), shows how referral traffic numbers trended. Now, the only question worth asking is: Reddit, WTF?! Naturally, we’re shocked when we dug up this data. While we cannot verify or refute Reddit’s user metrics, what our data does show is a drop in referrals to publishers from Reddit. Reddit seems to be hoarding its users and keeping all of its traffic within the social news site; our data, essentially, suggests Reddit is referring less traffic out to sites, which is strange behavior for a social bookmarking site. 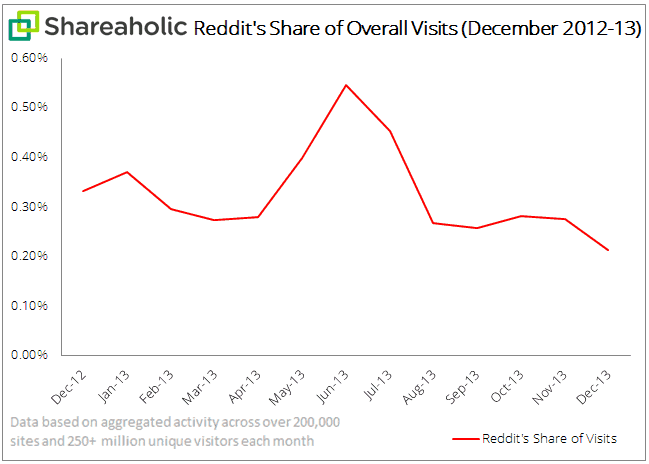 Although activity on Reddit.com may have increased dramatically from 2012 to 2013, sites around the web, sadly, aren’t seeing much of that traffic. If Reddit is sending fewer visits to sites, web stores and publishers, where else should brands, blogs and businesses turn to for social traffic? Our money’s on Facebook, Pinterest and Twitter. At least, that’s what the data would suggest. Ok, now it’s your turn to share your thoughts.